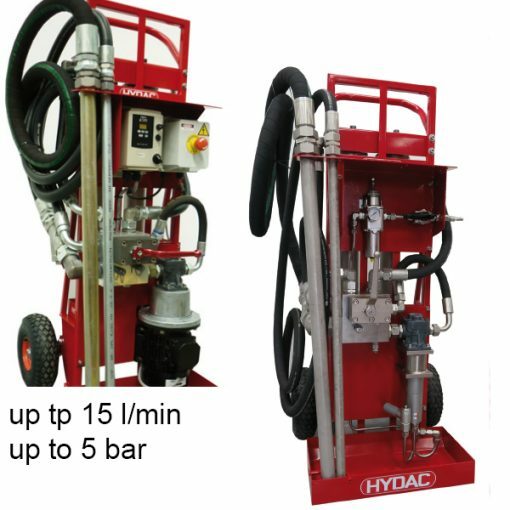 The HYDAC OFT3 / OFTM are offline filtration trolleys. It has a flow capacity up to 15 l/min and a pressure capacity up to 5 bar. The Offline Filtration Trolley is a mobile oil service unit. So, it serves for filtering oil when filling systems or when transferring hydraulic, lubricating fluids and to providing offline fluid filtration. Finally, this design has the amount of effort required to tilt the load off the ground. Indeed, a spring loaded foot operated lever tilts the wheel axle into the best position for lifting and moving the load.